As an Investment Advisor, I provide wealth management services to a select group of high net worth families, helping them manage wealth today and for future generations. I work for my clients as I would for my own family and aim to build lasting, meaningful relationships based on trust, integrity and outstanding client service. My business model consists of a disciplined investment management process and personalized service offering. At TD Wealth Private Investment Advice, we have in-depth experience in investment and wealth planning and we also bring in professionals with the expertise necessary to provide a holistic wealth management approach. This includes everything from a best in class financial plan, to investments and portfolio management, business succession planning, tax and estate strategies. My goal is to maximize wealth through patient, prudent, risk-aligned wealth planning and investing. I take the time to clearly understand your background, philosophy, needs and objectives. I work with you to design and implement an investment plan that prioritizes your goals and shows you the steps you need to take. I create your personalized investment portfolio, using an easy to understand process, that helps meet your income and growth needs. I regularly review and monitor your progress and keep you up to date. Daciana began her career in the financial services industry in 2005. She has held diversified positions across various financial institutions, bringing a unique perspective and set of experiences that shape her investment philosophy and process today. Daciana joined TD Bank Group in 2007, in the Business Banking group, where she structured complex lending arrangements across a broad scope of industries and loan types. Over the years, she has seen different types of companies in many different industries. The financial knowledge acquired in this area has allowed her to build a solid understanding of the financial markets. 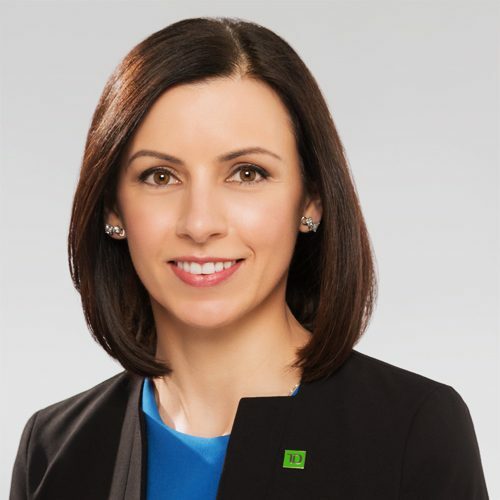 Prior to joining TD in 2007, Daciana developed a broad skill-set, working in the industry and making recommendations on investment for large pension funds, as well as gaining international business experience in Europe. Her professional experience also includes working at CIBC World Markets and Travelers Insurance Company of Canada. Master of Business Administration degree from McMaster University’s DeGroote School of Business. 2007 Recipient of Heather L. Main Memorial Scholarship for Women in Capital Markets - prestigious scholarship designed to encourage qualified women, in participating Canadian graduate business schools, to pursue careers in the capital markets. In my spare time, I enjoy spending time with my husband, two daughters and our labradoodle, Clover. I love travelling and appreciate great cuisine and learning about other cultures. I also enjoy reading, home décor, music and staying active.